Wembley woe as 10 man City lose by the only goal. Eric Dier's first Premier League goal in 18 months handed Spurs a narrow 1-0 victory over Cardiff who had Joe Ralls sent off at Wembley writes Sky Sports. The winning goal came after just eight minutes when Dier side-footed into the corner from close range after Davinson Sanchez's header had deflected into his path. Cardiff had their chances to equalise, particularly through Josh Murphy whose goalbound effort was cleared off the line by Toby Alderweireld, but Ralls' sending off for a knee-high foul on Lucas Moura after an hour proved costly. The result means that Spurs have moved into third place in the Premier League table while Cardiff have slipped to bottom following Huddersfield's draw against Burnley. Fresh from their disappointing defeat to Barcelona in midweek, Spurs started the game on the front foot and raced into an early lead. Kieran Trippier's cross into the box was met by the head of Sanchez and although the Colombian's effort was blocked by Sol Bamba, the ball dropped perfectly to Dier inside the six-yard-box to finish the rebound. Cardiff struggled to deal with Spurs' set-pieces early on and Sanchez almost doubled the home side's lead after a quarter of an hour when his shot was blocked by Neil Etheridge after the ball had dropped his way via a Lucas Moura run. After responding slowly to going behind, Cardiff had a great opportunity to equalise on 23 minutes. Josh Murphy showed remarkable pace to breeze past Danny Rose and latch onto a Calum Paterson flick-on and although he was able to lift the ball over Hugo Lloris, Alderweireld beat Junior Hoilett to the bouncing ball to hack it off the line. Either side of the break, Spurs had numerous chances to finish off the visitors. Lucas missed two gilt-edged opportunities to settle the contest before the interval. First, he missed a header from a Trippier cross and then side-footed a Heung-min Son cut-back wide, while Harry Kane and Lucas again were denied by interventions from Etheridge and Sean Morrison just after the restart. Just before the hour-mark, Cardiff's hopes of getting something from the game were dealt a huge blow when Ralls was given a straight red for a cynical lunge on Lucas by the halfway line. After the Brazilian had knocked the ball past him, Ralls hacked him down with a dangerous challenge that caught him by the knee. Kane was booked for his angry reaction to the foul. Despite being reduced to ten-men, it was Cardiff who actually had the best opportunity to score in the final half hour when Morrison's header from a Victor Camarasa free-kick forced Lloris into a smart save down to his right with the ball ricocheting off the post before being cleared by Alderweireld. One player who did look to link things together throughout was Harry Winks. No player on the pitch completed more than his century of passes with 68 of those coming in Cardiff's half, while only Kieran Trippier had more touches. Following a lengthy lay-off with ankle injuries, Winks has now put together a run of starts and he seems to be growing with every game. He could become a key member of Mauricio Pochettino's side in what is a weak point of Spurs' team at present. Tottenham are unbeaten in their last 38 Premier League home games against promoted sides (W35 D3). Cardiff are winless in their first eight games to a league season for the third time, and first since 1989-90 in the old Division Three. Tottenham have scored at least once in each of their last 19 Premier League home games, the longest current run in the competition. Cardiff remain the only side Tottenham striker Harry Kane has faced but not scored against in the Premier League. The England forward had six shots today, more than any other player in the match. Tottenham's Eric Dier scored his first Premier League goal in 546 days, since netting against Watford at White Hart Lane in April 2017. 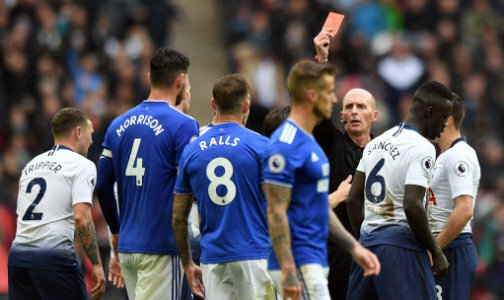 Joe Ralls' red card was only Cardiff's second in the Premier League, with Juan Cala against Sunderland in April 2014 the other. Tottenham: Lloris; Trippier, Sanchez, Alderweireld, Rose (Davies, 88); Winks, Dier; Sissoko (Wanyama, 85), Son (Lamela, 72), Moura; Kane.